The Conference proceedings will be published as a regular volume of the journal Hyperfine Interactions (Springer). Invited talks as well as oral and poster presentations will be included in the conference proceedings. All manuscripts will be peer reviewed according to standard international procedures before being accepted for publication in the conference proceedings. The procedure for submitting manuscripts is the essentially same as for the previous HFINQI2012 conference (Beijing, China). An important difference with HFINQI conference proceedings prior to HFINQI2012 is that there is no a priori page limit any more. This policy change is due to the fact that the local conference organisers no longer request a printed volume of the proceedings. Hyperfine Interactions uses an online submission system. The website for online submission to Hyperfine Interactions is: www.editorialmanager.com/hype. You can login to the submission system using the "LOGIN" button or "SUBMIT A MANUSCRIPT" button at the top left of the web-page after registering yourself with the "REGISTER" button. You will be asked to indicate which conference your submission is intended for. 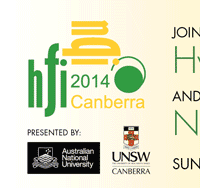 Please select ”HFINQI2014”. Feel free to use as many pages as necessary. Deadline for the electronic submission of manuscripts is noon on the first day of the conference, 22 September (Monday) 2014. With the consent of Springer, publisher of Hyperfine Interactions, the final accepted version of all peer reviewed and accepted conference manuscripts will be published on the website of CERN espace.cern.ch/ISOLDE-SSP/HFI/default.aspx where the conference manuscripts of HFINQI2010 and HFINQI2012 conferences already can be found. It is the purpose to use this database also as a repository for future HFINQI conference proceedings in order to facilitate access for the scientific community. All these conference manuscripts can be downloaded free of charge.